If you’re looking for a supermini that’s a bit different from the norm, then the Yaris could very well be it. With a spacious, practical and distinctive cabin, efficient petrol engines and compact dimensions there is plenty to like. When the first generation Yaris arrived in 1998, it shocked the supermini sector with its generous cabin and space age dashboard layout. By the time the second model was released in 2005, the Toyota had become cemented in the hearts of buyers. And though it wasn’t as interesting as some rivals, with the Yaris the Japanese manufacturer delivered reliability and practicality in spades. 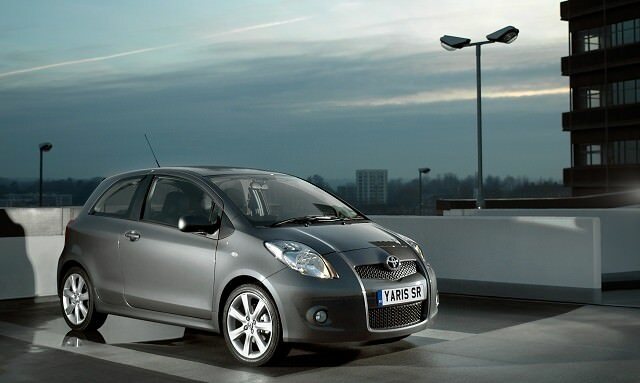 The Yaris was only available in two body styles – three- and five-door hatchbacks. Both were the same size, so apart from the extra openings there is no difference in practicality, with exactly the same cabin space. In fact, space and practicality are two things the Yaris does particularly well, the dashboard concealing an array of large storage cubbies. There’s even a clever rear seat arrangement that can be tumbled down to fold flat, or slid forward to increase the boot space from 272- to 363 litres. As a supermini the Yaris isn’t loaded with luxury trimmings but even the basic Terra models came well equipped while the range was finished off with the Luna and top spec Sol. Engine choice wasn’t vast, and started with the 1.0-litre petrol three-cylinder donated from the smaller Aygo model. With its characterful hum, the tiny unit developed 70hp, while the larger four-cylinder 1.33-litre model offered 86hp. Diesel buyers had only the 1.4-litre to choose, which offered impressive fuel economy for its 90hp output. The Yaris was available with a conventional four-speed automatic, or newer Multi-mode Manual. The latter wasn’t well-received by buyers, and there have been reports of poor reliability as well – so best stick with the slick shifting manual. It mates well with the light controls found elsewhere in the baby Toyota. While diesels often make sense for fuel economy, in the case of the Yaris you are probably best off opting for a petrol – for a start there are far more of them around. The 1.33-litre is the sweet spot, offering acceptable performance and economy, while the mid-spec Luna trim offers plenty of standard kit. As there’s little difference in design, and none in terms of space or size, we’d opt for the more practical five-door model. If you’re looking for a supermini that’s a bit different from the norm, then the Yaris could very well be it. With a spacious, practical and distinctive cabin, efficient petrol engines and compact dimensions there is plenty to like. Consider Toyota’s famed reliability and customer satisfaction record and it soon makes sense as a used buy too.